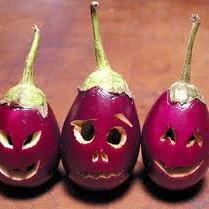 Subject: Urgent action on illegal GM foods in India – reg. 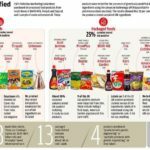 This is about the Centre for Science & Environment (CSE)’s lab study findings that they put out on 26th July 2018, showing how illegal GM foods (edible oils, infant foods, snack foods etc.) are flooding Indian food market, without any approval from FSSAI and by flouting other regulatory norms too. We want to point out to you that we wrote to you on 16th March 2018 itself, months before this expose by CSE, with a copy to the Union Health Minister, on the import as well as sale of GM foods illegally in India, in violation of the Food Safety and Standards Act 2006. 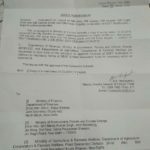 Our letter to you is available at: http://indiagminfo.org/fssai-keeps-mum-on-illegal-gm-foods-flooding-the-indian-market/ . We also pointed out to you that complaints on your online portal and on twitter were yielding no results. We gave you names of certain food brands and their products as examples of those which are violating the existing laws when they sell GM foods. 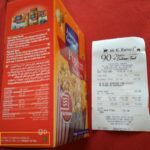 Hudson/Sattvic/ Jivo/Wesson/Crisco/ Mazola/Canola Harvest/CanDrop/Alom’s canola oil, Haldiram’s Bhujia Sev/Moong Dal, Tasty Treat’s Navratan Mix, Khatta Meetha etc., American Garden Popcorn, Jacker Potato Crisps, Betty Crocker Delights Super Moist Cake, Ragu Pasta Sauce etc. were some of the products that we explicitly named and mentioned in our letter to you. We had pointed out that these foods and their sale are in violation of FSSAI’s regulation, and must be withdrawn from the shelves and that penal action should be initiated by FSSAI. The CSE study now shows that some of these products even made false claims suggesting that no GM ingredient is used. Existing scientific evidence clearly points to numerous health risks from GM foods. Experiments conducted in different parts of the world, using various research protocols, show clearly that GM foods are not safe. Adverse impacts include effects on growth and development of an organism, organ damage, immune system disorders, cancerous growth, reproductive health problems including infertility, allergies etc., amongst other impacts. The lack of action by FSSAI tells the citizens of this country that, as the Food Safety regulator, you are knowingly allowing this illegal proliferation of unpermitted and hazardous GM foods in the country. The citizens of India have a right to safe food, a right to know what we are consuming and a right to make informed choices. All of this is being violated right now. The response from FSSAI, on July 26th 2018 (“Update on GM Food Regulation”) after CSE made public its lab testing findings, is wholly inadequate. It does not create any confidence in ordinary consumers/citizens that FSSAI is serious about regulating unsafe illegal foods in the country. Cost of testing cannot be made the reason for lax regulations, whether related to thresholds for adventitious presence or for compromising on long term safety testing of GM foods. FSSAI cannot use this as an excuse for lackadaisical regulation that puts citizens’ health at risk and if testing is indeed prohibitive cost-wise at the thresholds that ought to be fixed for any unavoidable GM presence, FSSAI has all the more reason to declare a complete ban on GM foods and have zero tolerance towards the same. 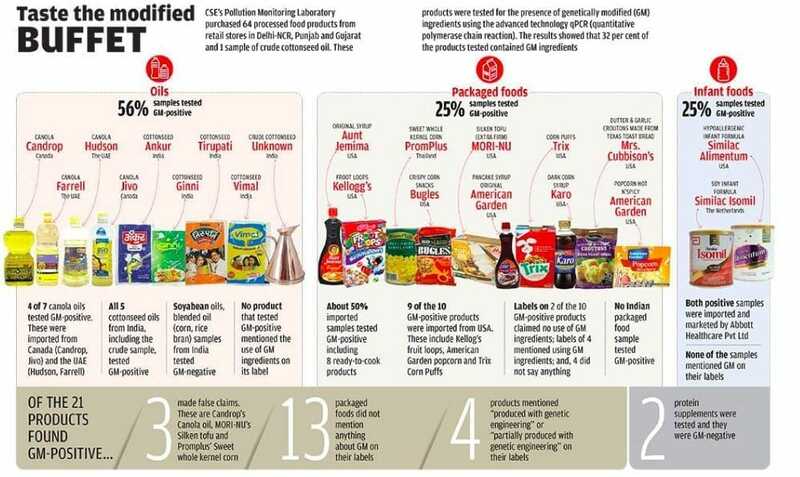 FSSAI now has the list of 21 food brands that have a confirmed illegality in that they tested positive for GM presence in CSE’s lab testing (attached is a CSE graphic image on this). FSSAI also knows who are the manufacturers and who are the importers in each case. FSSAI further knows which foods are being imported from GM-producing countries like USA, Brazil, Argentina, Canada etc., and which crops are genetically modified (corn, soy, cotton, canola, sugarbeet, papaya etc.). Order immediately the removal of all the 21 food products that have tested positive for GM in CSE’s lab testing. Initiate immediately penal action against all the manufacturers and importers in all these cases. Order further the removal of other “strongly-suspected-to-be-GM” (from GM producing countries, with ingredients that are known to be grown predominantly in their GM version in those countries and for crops for which GM versions exist in other countries) unless the food brand/importer shows a lab-based declaration that such foods are GM-free. Maintain the highest standards of safety for consumers, as laid down in Indian law and as per your affidavit to the Supreme Court and please DO NOT DILUTE THESE TO ACCOMMODATEVIOLATORS AND VIOLATIONS at the cost of consumers, as we understand is being contemplated by FSSAI. While FSSAI is considering allowing for 5% threshold for labelling of genetically modified food products, GM food products are not allowed to be sold in India. Not only this, countries such as France, Germany amongst others have a threshold of 0.1% for allowing of GM products that too for adventitious presence. Any GM presence in foods must only be allowed for adventitious presence only. It must also be remembered that we have lab facilities testing available for GM testing up to 0.01%. Set up lab testing facilities in each State and at major ports of import and ensure that each consignment of imported food, – including packaged foods, grains or seeds of those crops for which GM versions exist in cultivation or open air trials elsewhere, – is indeed GM-free. Make such testing facilities accessible to citizens too. Copy to: Shri J P Nadda, Union Minister for Health & Family Welfare, Government of India.